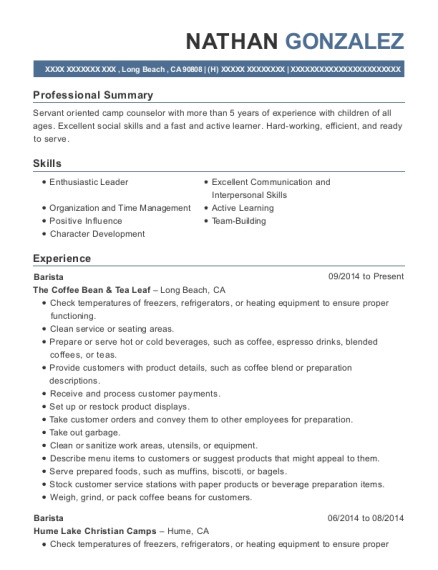 Seasoned Barista with more than four years of experience in fast-paced costumer service environment. Excellent serving and communication skills. Track record of achieving exceptional results in a calm, but effective working environment and ensuring quality in everything I create. Taking orders and helping costumers find and understand what they're ordering. Answer questions about products, drinks, & coffee. Switching from cleaning task to costumer service at moment's notice. Understand, operate and train ways to successfully close the store, while also satisfying guests. Keeping conversations and courtesies in a rush. Assume responsibilities for quality of product, keeping pars (bakery, food, cold press, milk, etc. ), closing the store and counting the drawer. Ensuring dishes and food and product are kept up on, as to not run out. Training new employees in drink technique and proportions while keeping up on nightly tasks. Knowledge of proper grind of beans for people's home brewing and in store properly timed espresso shots. Count till, delivery driver checkout, separate tips and run report on sales. Ensure that production table is clean, product fresh and safe by dating and using First In, First Out. Keeping pars on all kinds of meat, cheese, condiments vegetables, etc. Checking for proper fridge and proofer temperature. Resolving problems and diffusing issues that arise with guests and properly compensating for misunderstandings. Count and weigh all products for inventory. Make sandwiches and put orders together properly and timely. Lump together and know delivery orders near each other for efficiency. Arrive at destination timely and safely. Set up and organize catering orders both in store and on arrival. Take payments and make change. Associate of Arts : Social Sciences & Performance Arts Dec 2013 North Hennepin Community College － Brooklyn Park, MN Multiple Semesters on the Dean's list. 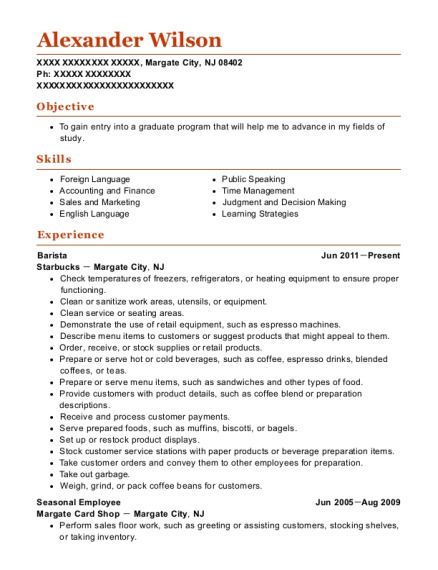 This is a resume for a Night Lead Barista in Maple Grove, Minnesota with experience working for such companies as Dunn Brothers and Erberts & Gerberts. 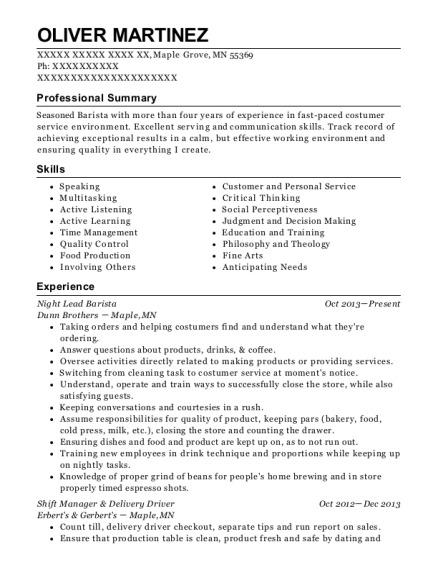 The grade for this resume is 0 and is one of hundreds of Night Lead Barista resumes available on our site for free. 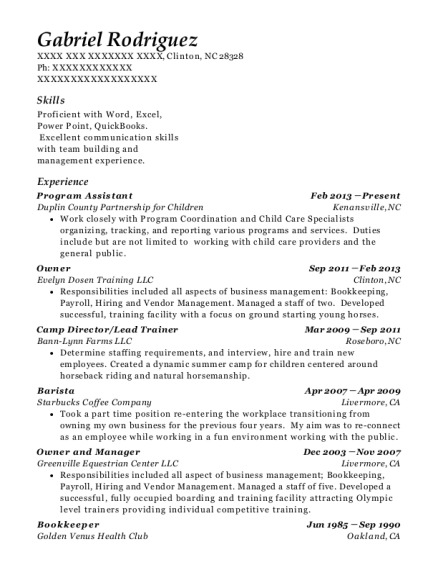 Use these resumes as templates to get help creating the best Night Lead Barista resume.